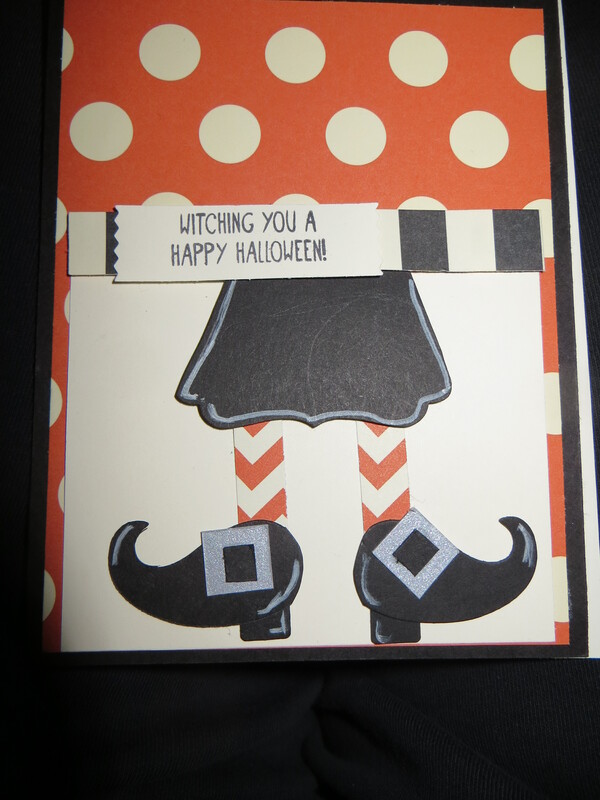 Today’s post is Cammie’s final card for the 2015 Halloween season. She features the Stampin Up If the Broom Fits #139693. She just used part of the single stamped image and then matted it on a piece of black cardstock. The focal piece was added to a spooky Spider Web doily and Cammie added a witches hat cut using the Stampin Up Boo to You Framelits using the Black Glimmer paper #139605. She added some Bakers Twine for the trim on the hat. Today’s post is the last of my Halloween designs for 2015 and I think it is my favorite. 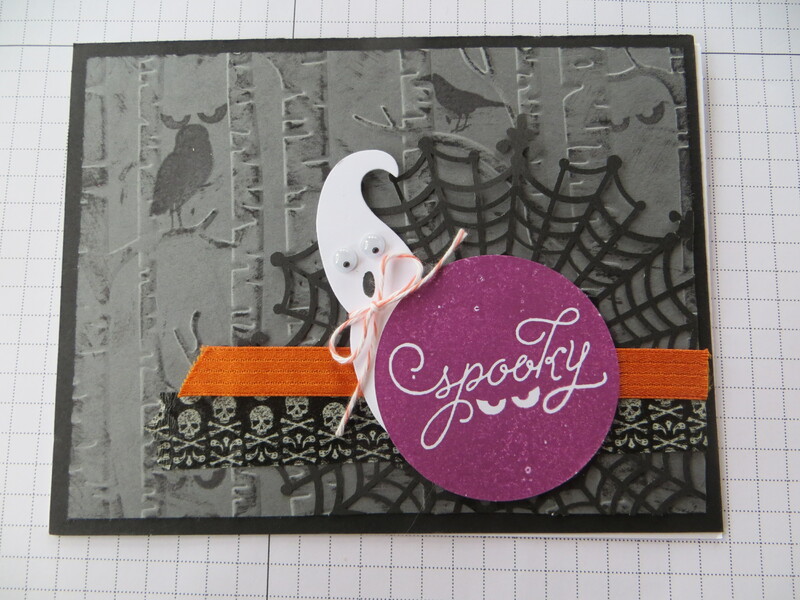 I used ancient Stampin Up DSP in classic Halloween colors. The witches skirt was made from an altered decorative label punched piece, the legs were from the Word Window and drum roll please…….. the shoes were made by altering 1/2 of the now retired Mustache die and the heel was from the retired key tag punch. Isn’t always about the shoes? The sentiment is from the retired Stampin Up Wicked Cool stamp set and then punched using Washi Label punch #138296. This card is what I call a spooky cute card! I started out with my favorite Textured Impressions Embossing Folder- the Stampin Up Woodlands TIEF #139673 and then smudged the trees by lightly rubbing my black ink pad over the trees. I added the dark crows from the Among the Branches # 139823. Next I layered the fabulous Spider Web Doily and then secured it with retired Stampin Up Washi tape and a piece of ribbon. The super cute ghost was cut using the now retired mustache die. I dressed up the ghost by adding wee googlie eyes, a hand drawn mouth and a bakers twine bow. The sentiment is from the Among the Branches stamp set and punched with a coordinating circle punch. Today’s post is all about the stamp. 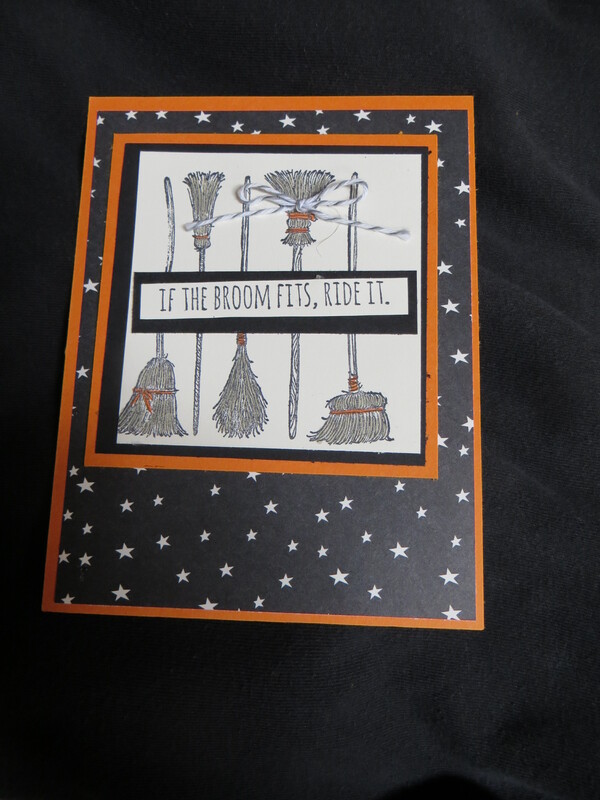 The Stampin Up If the Broom Fits #139693 single mount stamp speaks for itself and makes it easy to create a fun and festive card. I paired the stamp with a piece of the Stampin Up Happy Haunting #139584 DSP in classic Halloween colors. 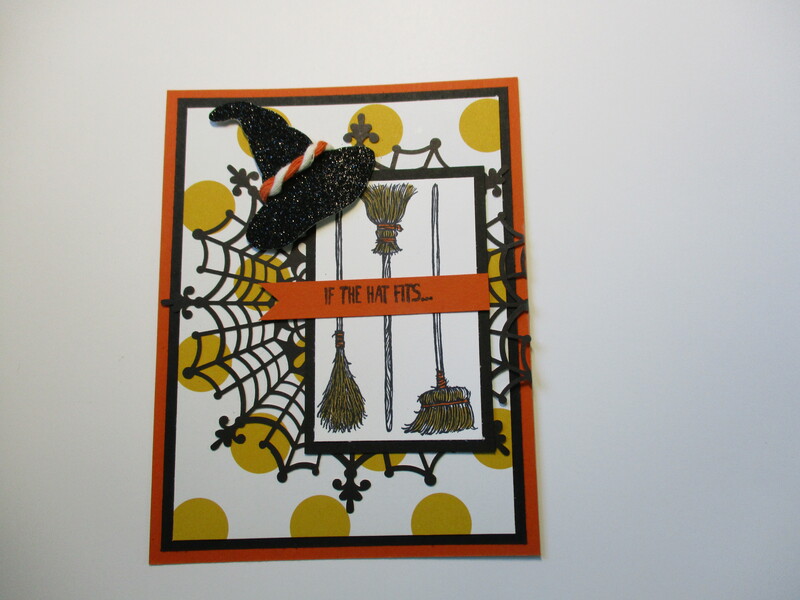 I finished with a piece of bakers twine and called it a day and created a stack of adorable Halloween cards. Halloween is in the air and Stampin Up has a line up of a few treats with discounts on this weeks deals. This is no trick be sure to check out the new Stampin Up weekly deals . Quantities are limited so be sure to order early. Deals are good thru November 2nd or until quantities are gone (which ever is sooner). Happy 25th anniversary to me and my husband. This is not the actual card I gave him for our anniversary but it is an appropriate card for the occasion. 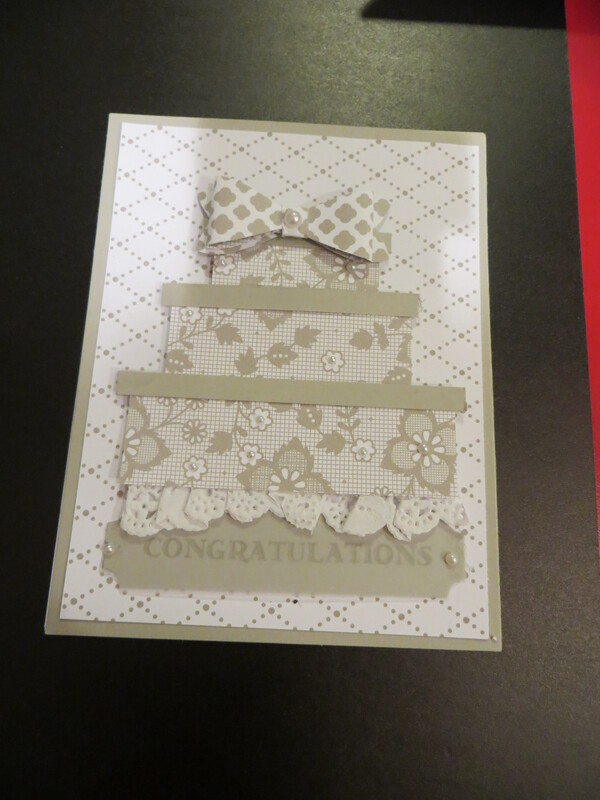 I made this card a while ago for a wedding using now retired DSP from the 2015 Stampin Up occasions catalog. I made a layered cake just by cutting strips of DSP and stacking them on top of one another. The cake topper is punched using the Bow Builder punch 137414. Todays card is another card featuring the popular Stampin Up Woodland #139673Textured Impressions Embossing Folder. Prior to texturing the trees with the Woodland TIEF, Cammie brayered her background. She added the sponged moon complete with the owl from the Dark and Dreary retired Stampin Up set. 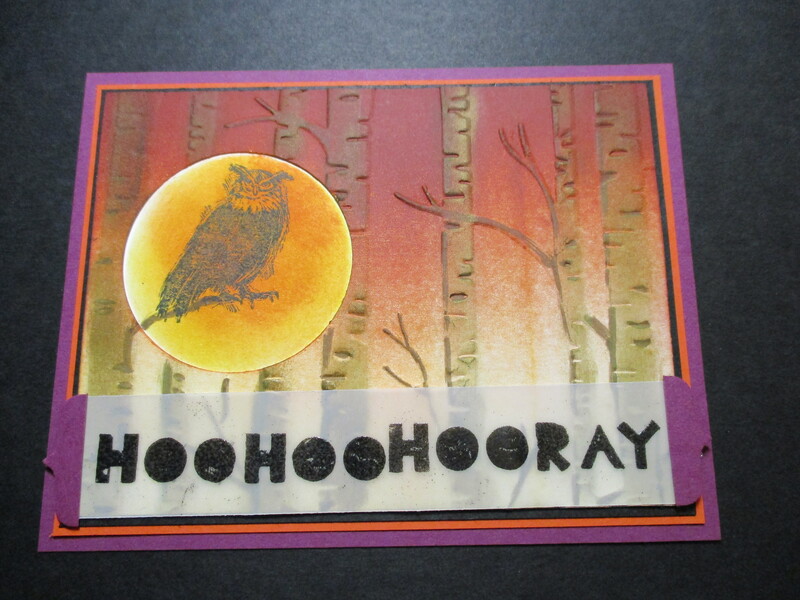 The fun thing she did was create the Hoo Hoo Hooray sentiment using the Hooray image from the now retired Geometrical stampset and inked up the Hoo twice in Stazon before stamping the Hooray onto vellum. What a fun and spooky card for Halloween!